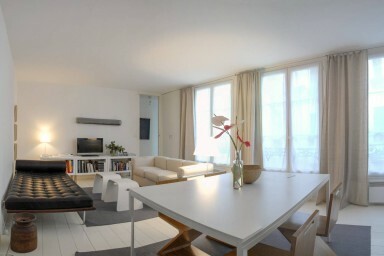 Light and Spacious one bedroom Designers Loft Apartment in the trendy market street area of rue de Bretagne. A great area to be; with art galleries, cafés and restaurants Galore! This fabulous loft-style one bedroom apartment is situated on the 2nd floor of a 19th Century building. The apartment is about 65sq. meters (700 sq. ft) with painted wood parquet floors, plenty of windows giving on to a quiet courtyard, so that even though you are in a lively area with lots to do, you'll have calm. The apartment entrance door opens directly on to a large living area with three big windows, decorated in sobre tones, with white floors and walls, grey rugs and beige linen drapes. There is original artwork, a couch by Le Corbusier and a Mies van der Rohe Barcelona couch in black leather. There are also great art books and a large flatscreen television with cable connection. The open-plan kitchen area looks over the living space, which also has a dining table with four designer chairs. The kitchen is equipped with a double-hub vitroceramic cooker, a small microwave/oven combi, a mini hotel-style minibar refrigerator and a ceramic sink, with plenty of crockery in the storage cupboards below. The bathroom, which is accessed from a small hallway between the bedroom and the living room has a large glass-walled shower and mosaic tiles, a large double sink and a saniflow toilet. The bedroom with two large windows, is in the back of the apartment and has a super king-sized (200cm x 200cm) bed and plenty of storage space. Somebody is available during office hours by phone to take care of you during your stay and we'll do our best to organise things as efficiently as possible to make sure you make the most of your trip. The Square de Bretagne used to be where the Knights Templar had there castle; now it's a lovely garden with a small lake and an old 19th Century bandstand, where you might see a group of elderly Chinese ladies practicing Tai-Chi in the early morning... The rue de Bretagne is a wonderful market street that has become very trendy over the last few years; you'll find some of the best Parisian art galleries, such as Yvon Lambert in the area as well as fabulous clothing stores, bookstores cafes, bars and restaurants. The great concept store Merci is also nearby with clothes, furniture, books, perfume and so much more for a good cause (they give all the profits for some of the poorest children in Madagascar !). The nearest metro station is 'Temple', a couple of blocks away. The metro station 'République' is also not far. There are also bus stops near by. We'd be happy to organise a very efficient, English-speaking shuttle service for you from the airport which is quite inexpensive and takes a lot of the hassle out of getting back and forward between the airport and the apartment, especially if you have baggage. For your convenience there is a safety box on the door frame of the apartment where you can recuperate the keys for the apartment. We will send you al the necessary codes as soon as your reservation is confirmed.